Eliminate trip hazards, close up cracks, and fix drainage problems with the PolyLevel® polyurethane expanding foam. Many concrete structures, not intended to carry heavy loads, are built without footings. Porch stoops and patios are two common examples. Unfortunately, soil conditions or the original contractor’s failure to properly prepare the site with compacted gravel, can cause these structures to begin to sink and can be easily aggravated by poor drainage. 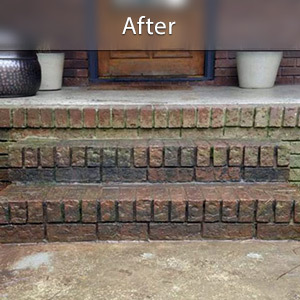 A sloped stoop or patio section will not only detract from your home’s appearance but will create tripping hazards – especially when icy conditions prevail. If the slope is toward the house, vast amounts of rainwater will be directed against your foundation, causing leakage into the basement and the numerous problems that come with it. PolyLevel® dealers can repair sloped stoops or patios to prevent these eventualities and save your home from extensive damage. Contact your local dealer and schedule a free estimate! This front stoop was sagging away from the foundation. The steps are cracked and uneven, showing significant settling. 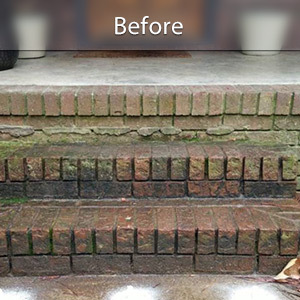 PolyLevel® was able to raise the steps back to their original position, with no cracking or sagging visible. Conventional repairs, such as mudjacking, may be used to lift the structure to level (or to slope it slightly for proper drainage) but tend not to be permanent fixes. 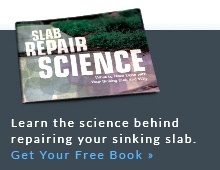 Injecting more heavy cement beneath a sinking stoop or patio will simply add unwanted weight. Within a few months or years sinking is likely to continue. Methods that involve excavation, such as demolition and replacement or the use of piers to jack concrete back into place will work, but at a high cost and with significant property disruption. In the case of a stoop, you may not be able to use your front door for several days. Also, don’t plan on having a party on your patio while the mason’s crew is trampling your lawn and gardens. 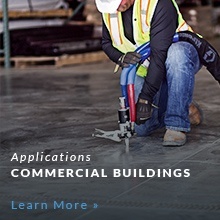 PolyLevel® is a high-density structural foam that can be injected through dime-size borings where soil is too weak to support the concrete slab or structure resting on top of it. As the polymer formulation expands, it exerts pressure against the underside of the concrete structure or slab and raises it back to its original position. The concrete, whether it’s a stoop, patio, sidewalk, or driveway can be put back into service almost immediately. The small holes are then patched and no mess is left behind. If your stoop is pulling away from your house, or your patio no longer pitches in the right direction, contact your local PolyLevel® contractor for an inspection and Free Estimate. Other concrete leveling applications include slabs for sheds, exterior walls, fire pits, masonry mailboxes, and outdoor pizza ovens and masonry barbecues.